ice, originally uploaded by biroschik2000. 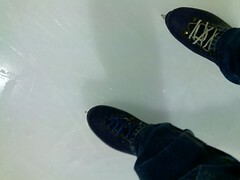 A show of my feet when I was skating with Cecilia. 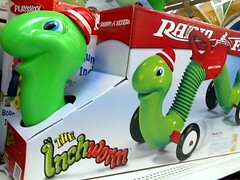 The inch worm. This thing is awesome. The inch worm to end all inch worms. When is a Scanner Not a Scanner? When it is a canoscanner. Goofy made up names like this bug me. I bought a film scanner so I could scan in old family photos. And the Holga negatives. I bought a Holga camera to experiment with... Even with all the digital equipment I now have, I cannot resist the dreamy look of the Holga prints. Speaking of prints, getting 120 film processed is more of a chore than I expected. I found a local lab that will do the work. Wal*Mart also prints the film for about a third of the cost, but the film is sent out. I shot a quick test roll, and have dropped it off to see how good Wal*Mart does. I'm half convinced that the film won't get processed. I'll know for sure on March 19.